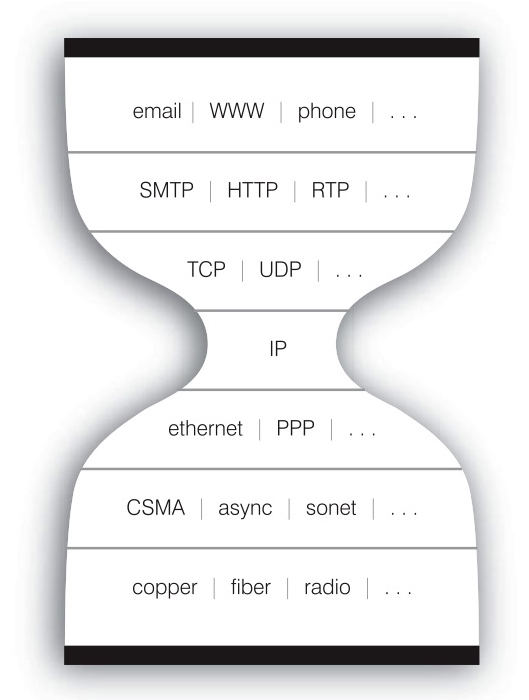 It’s the classic internet hourglass with signal carriers down the bottom, IP in the middle and applications up top. You can see the World Wide Web perched atop HTTP, one more technical layer in a technical layer cake. It’s maybe because I’m not that technical but I’ve never really seen the web as a technical layer on top of the internet. In terms of technical design there’s not that much there. The design decisions of the web always seemed more political / ethical than pure technical. So at least in my opinion the web is a political / ethical layer above the internet. The Web is designed as a universal space. Its universality is its most important facet. I spend many hours giving talks just to emphasize this point. The success of the Web stems from its universality as do most of the architectural constraints. And that’s more important than any tech spec. The web isn’t politically / ethically neutral and wasn’t designed by people who are / were politically / ethically neutral. Which is why the most important design decision of the web was statelessness and the most important architectural style is REST. Statelessness means everyone has equal access to information regardless of age or gender or ethnic background or physical location or physical ability etc etc etc. Because the web doesn’t care about who you are, only what you asked for. Which is also why accessibility really matters. Anything that restricts access to information to any one group is bad. Which means accessibility also means mobile views (because that’s the main access point for many people in “less developed” countries) and data views (because for some people the access they want is to the raw data). And it’s why anything that attempts to impose state on top of the web is, in general, bad. It just adds friction and any friction reduces people’s access to information. So walled gardens, paywalls, anything that requires you to log in, anything that forces you to accept cookies, anything that needs to know something about you before it gives you information. But more often it’s a good thing. Because I could search for the TimBL quote above, find it, copy it and paste it in here. And when my daughter does her homework (actually she’s 4 so doesn’t really have any yet) she can go to the web and take a picture and paste it into the story she’s writing. And sometimes she’ll probably steal and sometimes probably give credit but in general what you can find you can borrow and take into your real life and reshape and recontextualise and make new meanings. And that’s good. And there’s other ways it’s good. The election day Sun front page barely left the presses before pictures of it were winging round the web. And then people took that image, downloaded it (because the web makes that easy – it didn’t have to but it does), modified it and uploaded new versions. Which people commented on and talked about so more people made more versions and talked more about press bias and made jokes. And I think that’s healthy. There have been occasional attempts to fragment the web. To create an academic space or a commercial space or a copyleft space or a ‘safe’ space. Apple’s shiny iThing app store model is just the latest attempt. Usually the motivations have been honourable. But the effect is always to create a something that’s less free than the open web; to take a public space and turn it into a policed enclosure. Or maybe like a public space in the same way a shopping mall might be thought to be a public space but is owned and controlled and often privately policed. Policing access is dangerous because it removes universality. And policing re-contextualisation is dangerous because it takes away the right to fair usage (my daughter’s homework…). But the people who really do want to steal will always find a way round any form of rights restriction that’s embodied in code and not in community norms. So you punish the “fair users” in an attempt to restrict the real “criminals” who get round the restrictions anyway. And end up building something that just frustrates. So I really think the web (not the internet which is really just some pipes) is the greatest thing we’ve ever created. More than telly, more than radio, more than newspapers, more than books. Because it’s universal and because it’s open for reuse. But there are problems. Anything that requires a computer and a phone line (or at least a web capable mobile) can’t quite be universal unless everyone has those things (or lives in a community with shared access to those things.) There’s a lot of talk about digital inclusion, about taxes to fund broadband and about universal access to the web. But it all misses the point. It was never just about having access to other people’s information. It was always about everybody, everywhere having the ability to add their thoughts, the things they know, to the web. Treating digital inclusion as a question of connecting pipes to homes is an easy mistake to make because it follows established patterns of water and gas and electricity and television aerials. But the web was never designed to be a broadcast / distribution mechanism. Digital inclusion doesn’t just mean everyone needs to have a receiver on their roof; it means they need access to a transmitter too. Without the ability to transmit, to publish, people just become passive consumers of other people’s information. And digital inclusion has to include the ability to produce as well as consume. So physical access is only the first hurdle. Once you’re over that, the barrier to publishing is still too high. Owning your own publishing space means you have to start understanding domain names and DNS and server set ups and code installs and updates. Which for most people is just too difficult. It’s certainly too difficult for me which is why I end up publishing this here (wherever here turns out to be). Luckily “social media” sites arrived to fill the skills gap. But social media is a bit of a misnomer. The web was always supposed to be social and always meant to be open to contributions from everyone. The innovation of social media wasn’t really socialness. From Flickr to WordPress to Blogger to YouTube to Twitter the real innovation was the commoditisation of publishing technology. Now everyone could share what they knew. But at a price. where for YouTube you can pretty much substitute any website with user submissions from Facebook to the BBC. It means you retain copyright but we we give ourselves so many rights your copyright is virtually useless. Content acquisition on the cheap. It’s a bigger problem than digital literacy because there’s no point educating people about the issues if they still can’t publish and avoid them. The second major problem is privacy. You’d have had to be living life under stones to not notice that privacy has become the big issue of year. Facebook in particular have gotten regularly flamed for their ever decreasing privacy circle. Now they’re stepping outside the realms of knowing about your social network, your status and your photos and attempting to own the graph of what you like from elsewhere on the web. There are, as ever, arguments on both sides but the only one really worth reading is danah boyd‘s Privacy and Publicity in the Context of Big Data. There’s too much in there to really sum up in a one liner but my attempt would be: privacy issues aren’t about how much information you share; they’re about the gap between your perception of the context of sharing and the reality. Extrapolating from that, once you trust your personal information to “the cloud” you lose control over the context of use. Your data can be meshed with other data in ways you didn’t even begin to anticipate. And the rules around context can be nudged in whatever direction most benefits the cloud service. The social media “cloud” seems uncomfortably like Mr Humby’s dream web. And unlike Tesco it doesn’t even pay you for your data. Obviously there are worse fates than being the target of one of Clive’s targeted mail drops. Liberal democracies tend to assume they’ll always be liberal democracies. History seems to suggest otherwise. If the worst were to happen do you really want all that personal data out there outside your control? You might end up with more to worry about than whether your prospective boss sees you drunk on Facebook. Is Clive’s web the one we really want to build? Or is there a fairer, more distributed solution that allows everyone to share the things they know on their terms? With the power to publish, redact, edit… I’m probably in danger of jumping on Steven Pemberton‘s bandwagon (who’s been saying this for several years now) but until everyone owns and controls their own publishing space we won’t really have built the web. And (with my day job hat on) until “the public” can “broadcast” without fear or favour we won’t really have built public service broadcasting. It’s the original logo for the World Wide Web drawn by its co-creator Robert Cailliau. Until Dan Brickley pointed me at it I wasn’t even aware of its existence. The most important point is it doesn’t attempt to qualify the ‘us’; it just means everyone. In my dream world everybody working with the web in any capacity would have this stapled above their desk. So when all the talk of product planning and sprint planning and deployment and test driven development and check ins and check outs and branded experience and user stories gets too tiring you can look up and remember why we’re doing this. Crazy old school www logo! It’s amazing how far we have come in so little time. One of the best comprehensive-yet-introductory explanations of the importance of the open web I’ve seen. Well done! All I see is Christina Hendricks…. Agreed with Geoffrey. Very well-written and well-articulated article. Thanks. Excellent article, Tom. Brilliant, thanks for such balanced and thoughtful insights expressed so articulately. I really enjoyed reading this. I also share your enthusiasm for the Web and its intended universality. I also like what you say about the creators of the web, not being ethically neautral people – they did it because they had certain values about freedom and accessablilty to information. I only started blogging in February, but I have found it such a rewarding experience of self-expression – liberating and fulfilling. At the same time I’ve been surfing the net for years and have found that I have been able to massively broaden and deepen the scope of my knowledge and education through this medium. I guess I still turn to books though for the rich material, in depth, but I find these books and new authors through searching topics and writers on the web. Thanks alot for your article, Tom, REALLY enjoyed it. Look forward to catching up on some more of your articles later. Bravo! I agree with David F.: “balanced and thougthful insights” expressed so accurately that even I could follow, although I am not a native English speaker and you mention many things in this article that I don’t know. But I also saw your references, so I guess I’ll have a look at them. Greetings from Mexico. I have enjoyed learning about others and viewing their blogs via the internet on WordPress. I’m new at this, but I enjoy finding out about the world this way. It has been quite a ride. I am sorry that I do not have time to read your full blog post, but from reading the first couple of paragraphs, you are using a purely technical decision (that the web is stateless) to justify a political stance (net neutrality). I agree with you that the web should be open and equal, but stateful vs. stateless has nothing to do with it. Statelessness means that each each request is taken without the context of what other requests the same ip address previously requested. No one is changing that, if they did, the web would not be able to function. Statelessness means that clients do not maintain a constant connection to a website when not loading a page. It is a scalability issue. If anything, net neutrality is a matter of the IP and lower levels. They are the ones that should be treating a packet the same regardless of the payload (and they are the ones that are used in routing, theoretically the ISP should not be looking at any of the higher layers). Great post, I particularly liked your ideas on “the cloud” and how once you submit your data, it can be used and mangled out of your control, a bit worrying. I am an advocate of the open web and social sharing but within reason, well, within safety. I felt the latter half of your article really captures the nature of the web as a sharing medium, and how policy decisions are currently falling short. I feel this pattern of policy happens because the government sees the web as a way to broadcast to citizens, often with the implication that it’s a cheaper means to do so, rather than allowing citizens to say anything in return. When the government talks of “connecting” to citizens using the web, there’s a long way to go before the connection goes both ways. Your article starts to set a base for this discussion. Well written and interesting – more so because i agree! Web – open?! Good luck! It was a brave attempt by an intelligent man (Berners-Lee) but taken over by the World’s governments and big corporations. Apart from the fact that many people simply don’t want to share everything with billions of anonymous strangers (myself included) the politicians and key business players simply wouldn’t allow it. I am far from being Tech-Saavy, but I do understand the NEED for everyone to not only have access, but the ability to contribute. I fortunately, or unfortunately, depending on who you ask, have begun posting on my Blog as well. It is quite liberating, to a certain extent, to post. And yet, due to the “Cloud” that you mention, I have held back on my own posts…Perhaps a “Pen Name” is in the near future. A lot of information, very well written! Interesting read! Super Super post Michael. Looking at the comments though, it does seem that some people are confused to who’s the author. Thanks everyone for your comments; one thing I would like to point out however is that although this is my blog this post was written by my friend and colleague Michael Smethurst. Interesting read. The ‘having a chance to publish on the web’ part has been put forth very well. While reading this I was reminded of one of BBC’s own recent documentaries – ‘The Virtual Revolution’. Chapeau, Michael. In these days dominated by “Politics”, how refreshing to see some genuinely radical political thought being applied to the technological domain as a reminder of why those of us working in it are (or should be) doing what we’re doing. I’ve been doing some work recently with a creative arts organisation who do a lot of work with learning disabled people, and have similar ideals, in a very different domain, about what accessibility really means (in their case, as it relates to art). I’m fascinated by how your concept of universal read-write digital access might scale to those with learning disabilities. Very interesting post. It has many great points to it. Though a totally open web is a great idea, I doubt it will ever actually exist. that was really well written. No wonder they featured you on freshly pressed. Thanks for the heap of info [my brain hurts]. enjoy your day. I am totally AGAINST government regulations of the internet. Regarding ethics, it’s really subjective category.